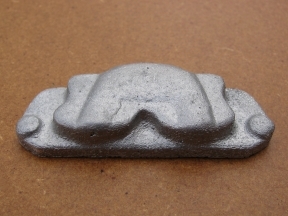 Surprisingly, this fiddly little casting looks as though it is pretty accurate. The passage will want a bit of careful treatment, as it is knobbly and has quite a bit of sand still adhering to it. 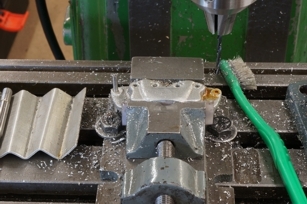 This wants doing before machining to ensure the delicate sealing face does not get scratched. There is very little metal at the bottom edge of the passage, meaning the casting wants to be set as high as possible. 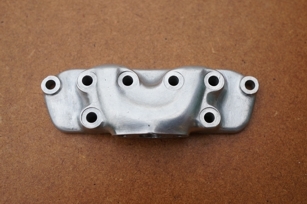 But here is also very little metal to clean up the carburettor mounting flange, meaning the casting wants to be set as low as possible. 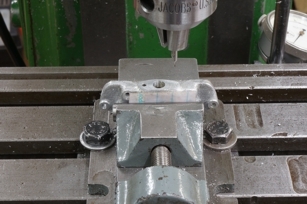 Machining the face first, and then the flange to a just sufficient area will determine how this works out. 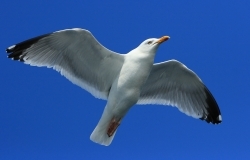 The positions of the cast-in bosses on the face will also have a bearing on the matter. 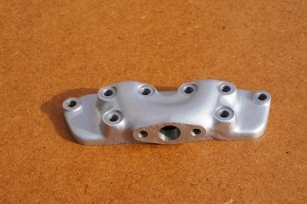 To get the flange an equal thickness all round, it will want supporting on narrow parallels. It may be necessary to make a cradle to hold it. 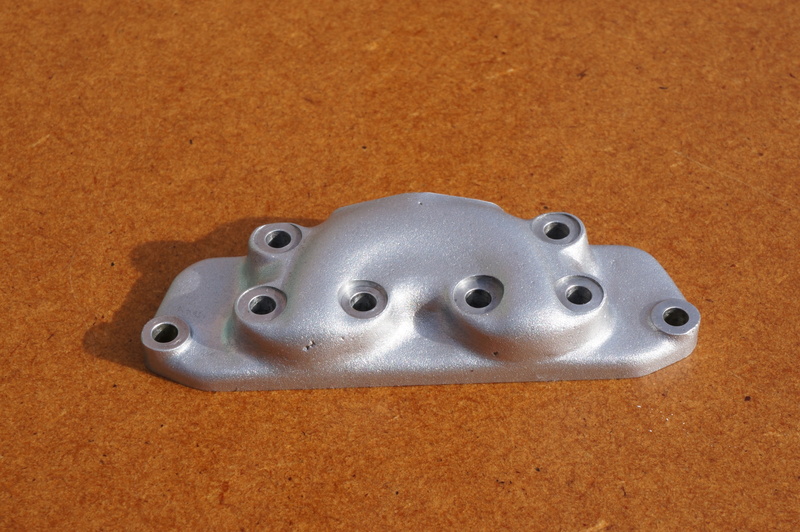 The top edge will probably need machining to match the exhaust manifold. The top row of bolt holes will be taken from the exhaust manifold, spot-faced from the front afterwards. While doing preliminary work on the Carburettor casting, and while I had the 4-jaw chuck on the lathe, I decided to investigate the manifold to see if there was any scope for increasing the bolt hole centres on the carburettor flange. 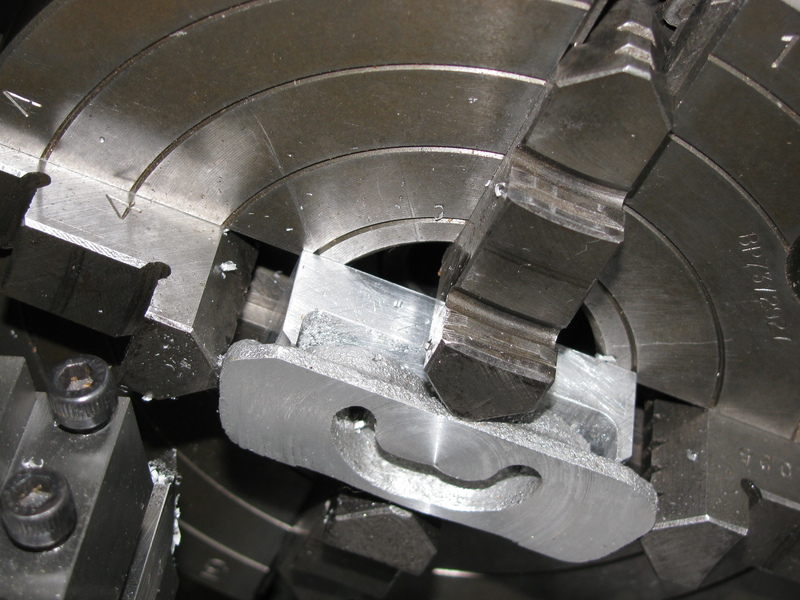 Machining this close if not to finished dimension was just sufficient to clean up a face long enough for the original flange, and still a bit short on the width. 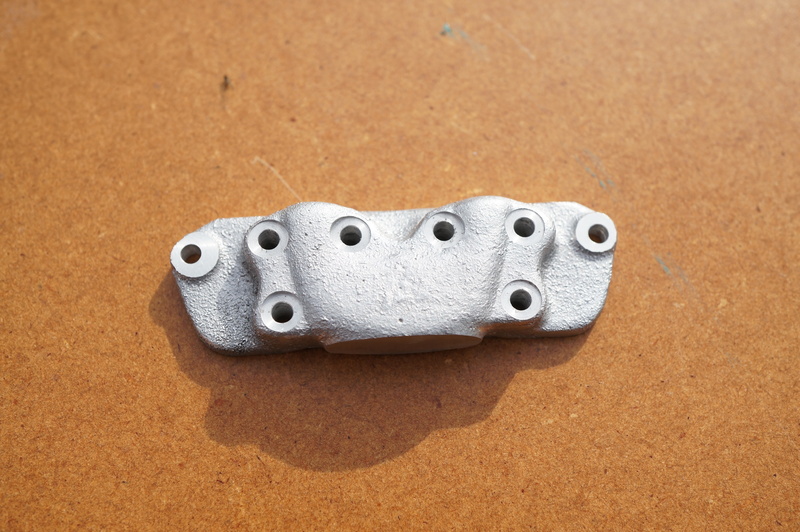 Exactly how best to get the finished part out of the casting is still in question, and the next feature to contribute to the decision is the boss at each end for the outer-most bolts. These will probably give a bit of vertical latitude by cleaning up larger than necessary. If so they can be subsequently cosmetically dressed to be concentric with the bolt holes. 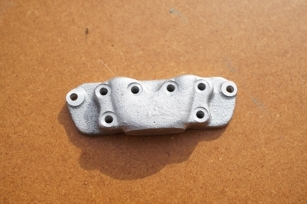 To allow this casting to be further assessed, I machined the spot faces on the outer bolting bosses. As it turns out, they will allow very little scope for adjusting the casting position. The tops of the two inlet tract bulges look as though they will provide a datum for getting the casting level. Firstly, I made a pair of filing buttons for the outer holes. Using a collet, the 7⁄32″ silver steel ran out by only half a thou so they just needed facing, drilling and parting off. 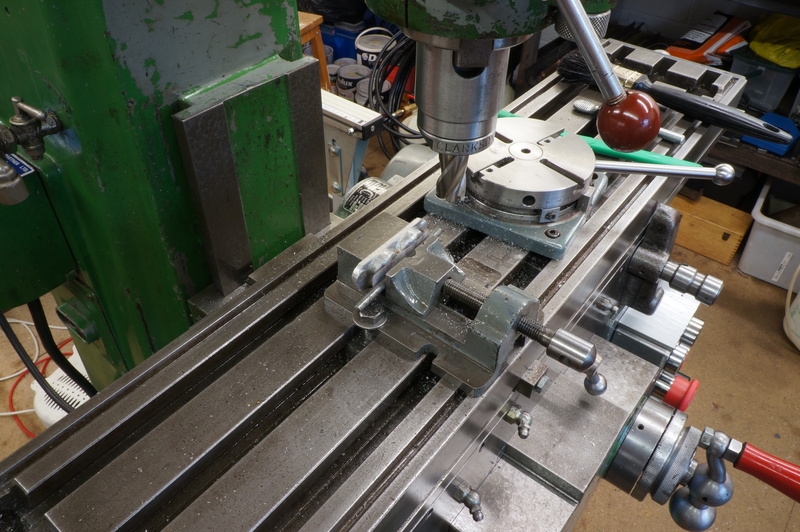 Next I set up in the mill to do the mounting holes. Being a bit suspicious of the milling machine y-axis dial readings, I set up a DTI to check it. 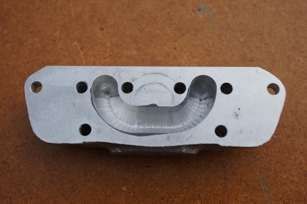 It is about 0.010″ out on the small distance from the top edge to the hole centre line. There seems to be something wrong, but I will deal with it when the mill eventually gets a proper strip down. I drilled the six holes in the top row, spot-facing the middle four, and then went back over the spot faces, taking another 0.005″. After drilling the bottom row, cleaning up and deburring, I tried the manifold over the studs on the partially assembled engine. The holes are drilled 2.8 mm so they have very little clearance on the studs, but, with a bit of wiggling, it fits over all eight. I am happy with that. Also the carb. mounting flange is accurately centred. 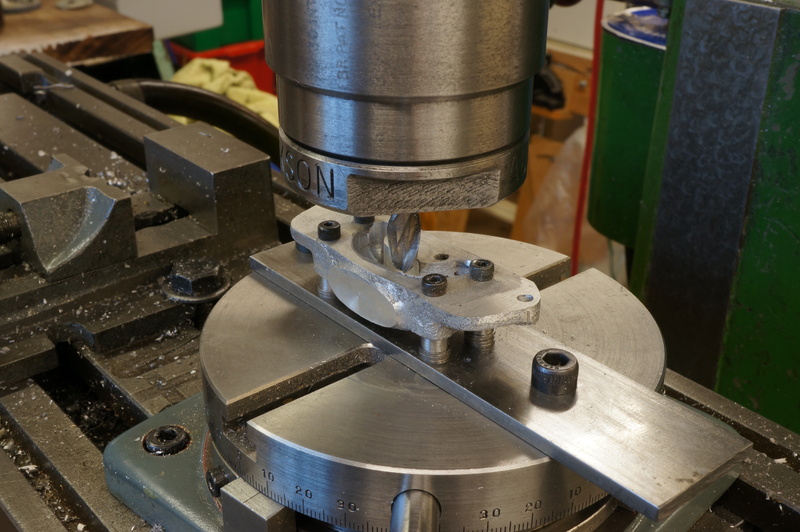 Continuing to tool up for milling the inlet tracts in the inlet manifold, I made a 3⁄16″ diameter centre locating pin for the rotary table, and drilled and tapped the jig plate. 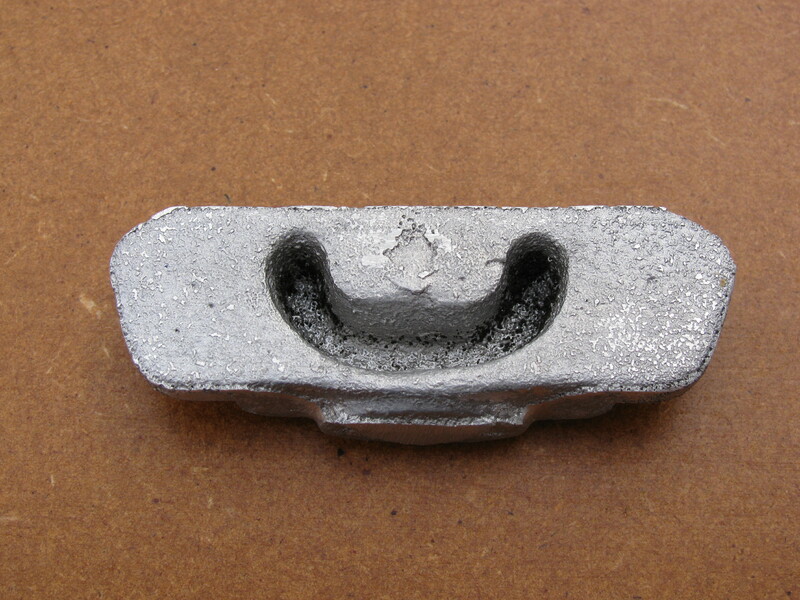 The tapped holes are for mounting the manifold on the plate, and there are two 3⁄16″ holes to fit over the locating pin, positioned at the centres of the inlet tract arcs. The milling went well, with the jig justifying itself in making virtually fool-proof an otherwise extremely difficult set-up. 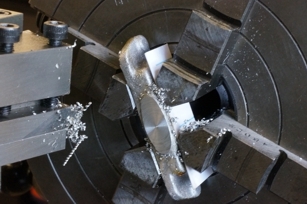 The external shape of the casting meant that the cavity needed to be 11⁄32″ deep in the middle to fully uncover the inlet hole from the carb, but no more than 5⁄16″ at the ends to allow a safe thickness. 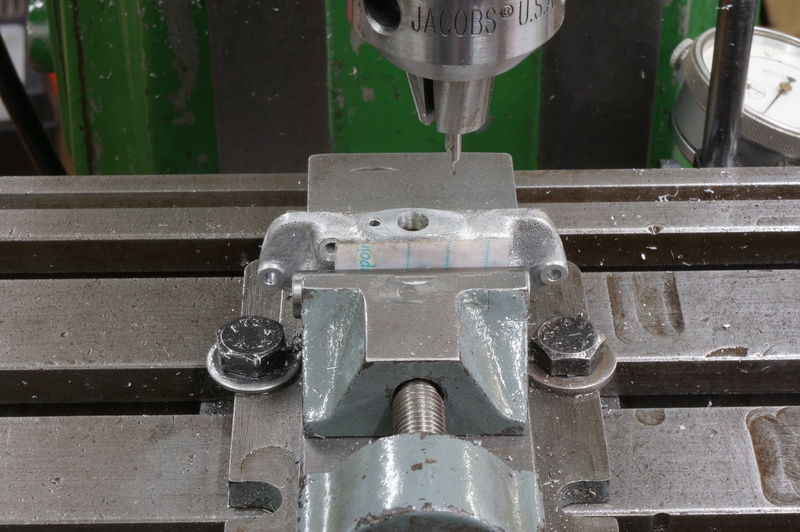 I used a ¼″ ball-nose slot drill, and cut the left hand side first, using increments of 0.005″ in depth for every 15° of rotation of the rotary table. I found this looked too coarse, so I filled in the intermediate 7½°, 2½ thou, steps. The right hand side I cut with the smaller steps from the start, and it looks a bit neater. Even with the jig, this all still needed concentration. 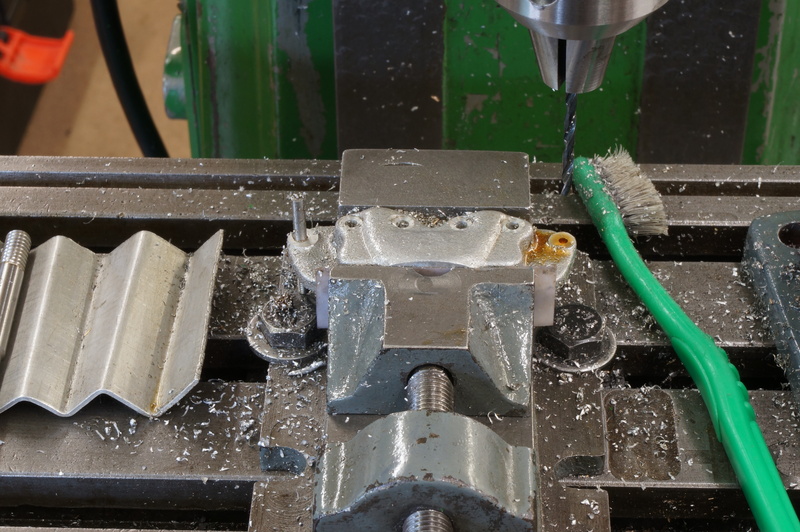 I worked on smoothing out the machining bumps in the inlet passage. The best tool I found was abrasive paper wrapped round a match stick. This will need more work to produce a nicely polished surface. After more work on the flange templates, I drilled the port and mounting holes in the carburettor flange, and milled a finishing cut of 0.003″ across the flange. Using a9⁄16″ end mill at 800 rpm, the finish could have been better. Both manifolds will be blasted together, so I have dealt with this at Exhaust Manifold.